Hi guys hope everyone is having a wonderful Friday. Yesterday I didn’t post anything to the blog, it was one of those days. I was in the kitchen trying to make a vegan soda bread. It was a complete disaster I ended up with a brick instead of a fresh baked loaf. I guess I’ll just keep trying until I get it right. 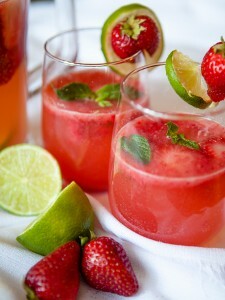 The sun is shining, it’s very hot and muggy out that’s the reason for this strawberry mint spritzer. It’s so refreshing on a hot day. It’s not a sweet drink, I didn’t want to add sugar to this strawberry spritzer, so for you guys that like sweetness you can add 1-2 tablespoon of agave to the pureed strawberries. 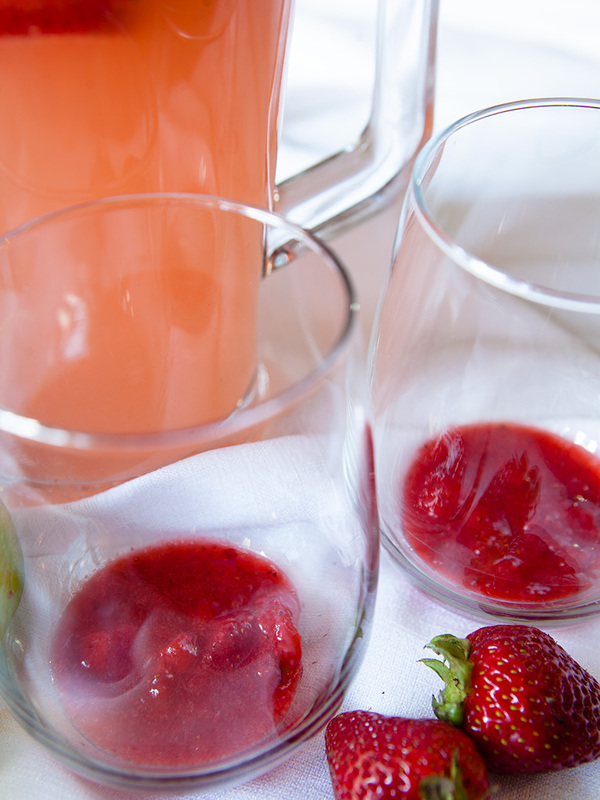 It’s a delicious spritzer that can be served at picnics and BBQ’s. For those parties with friends rum or vodka can be added to it for a alcoholic drink. These fun little fruit filled ice cubes are a great addition to any drink as the ice melt lime and strawberries into your drink. I added 4 strawberries and 3 lime ice cubes to my jug. The rest I saved for a later date. In the bottom of the glass you need to add your strawberry puree before pouring your drink. As I said this is not a sweet drink due to the grapefruit juice that I mixed with the Perrier water. 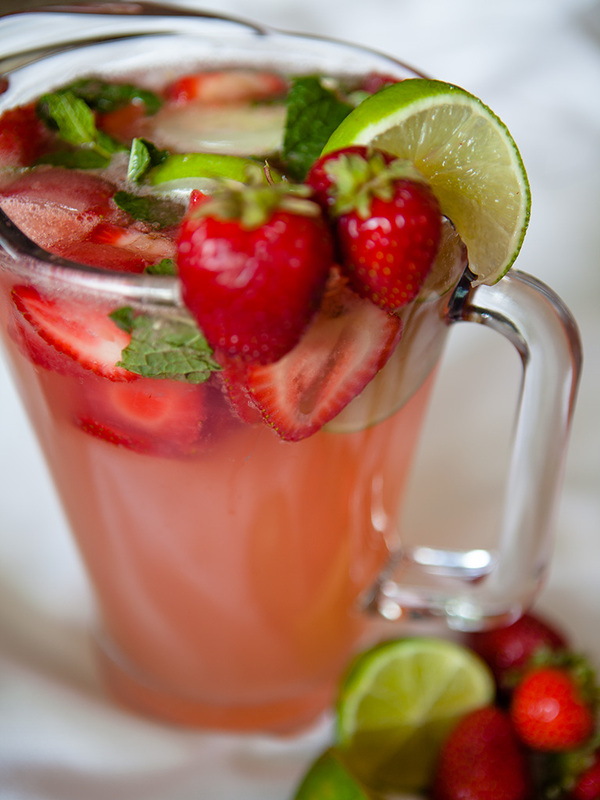 The strawberries do add some sweetness to the drink. First you are going to make fruit ice cubes for the spritzer. Slice 4 strawberries. 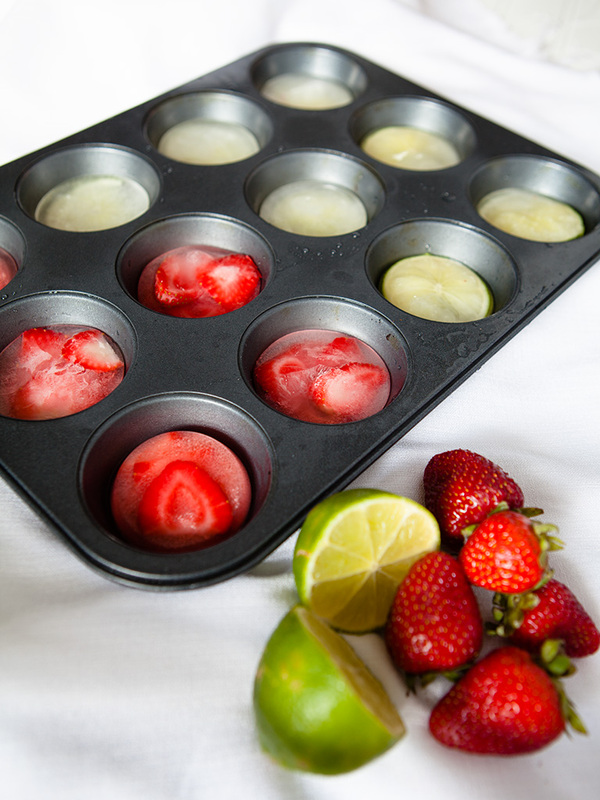 Fill a muffin tin with water and place a couple of strawberries and sliced limes in the water. Put in freezer. Take about 6-8 strawberries and purée in a blender. If using agave or a sweetener mix in puréed strawberries. Set aside for later. In a large jug add grapefruit juice and Perrier. Slice rest of strawberries and add to jug. Tear fresh mint leaves and stir into jug. Give it a stir. Add some of the fruit ice cubes to the jug. Take a glass and put some strawberry purée in the bottom of it. 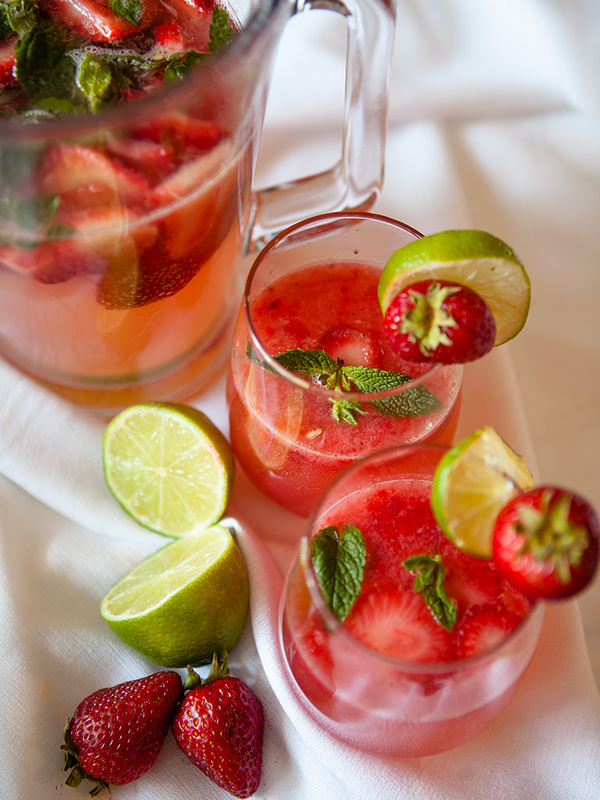 Pour grapefruit spritzer into glass and garnish with strawberry,lime and a sprig of fresh mint.